Support of an "extended family"
The support of an "extended family"
The types of assistance are different for each family, based on the needs expressed by the foster parents. Foster parents' stress levels are significantly reduced. 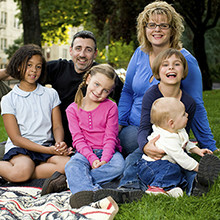 Foster families are able to take and keep sibling groups together rather than dividing them among multiple foster homes. Foster parents are have more time to work with children who have special needs. Contact the FFNY Program Director for more information.